Overpriced and underperforming the S&P, Ralph Lauren stock will go nowhere fast. Apparel manufacturing hasn't been a great business to be in for decades, and apparel manufacturing stocks have never been particularly exciting. But lately, one stock in the group has been underperforming the stock market as a whole, and performing particularly poorly relative to its peers to boot: Ralph Lauren Corporation (NYSE:RL). Why? If you haven't taken a look at it in a while, you might be surprised to learn that Ralph Lauren's stock price is actually in the triple digits. This might lead you to think things are going well for the company -- but they aren't. When you stack Ralph Lauren stock up against two of its bigger rivals, the ambiguously named PVH Corp (NYSE:PVH) and V.F. Corporation (NYSE:VFC), it turns out that Ralph is actually the only stock of the three that's been underperforming the S&P 500 over the past year. As the S&P gained 20%, Ralph Lauren stock tacked on only 15% -- barely half the 29% gain at V.F., and only a third of PVH's 46% return. True, Ralph Lauren stock also pays a dividend, but at a mere 0.9%, it's hardly enough to make up the difference in stock price gains -- and, in any case, Ralph's dividend yield is less than half the payout at V.F. Why is Ralph so stingy with its cash? Perhaps because, of the three companies named, it's got the least cash to play with. 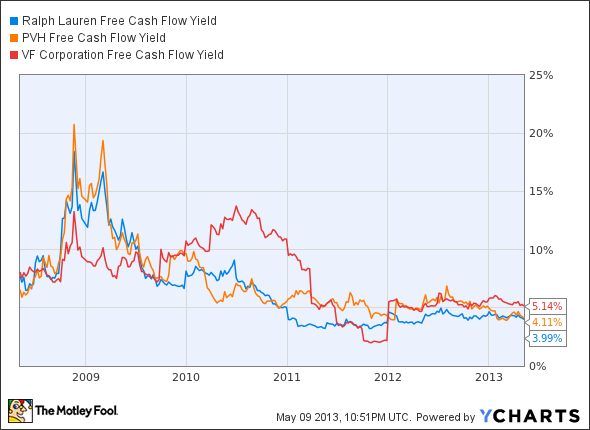 Lay the three firms side by side, and you'll quickly see that Ralph has the worst "free cash flow yield" of the bunch. Yet, it's surprising that, for a company that's producing less cash per dollar of market cap than either of its Big Apparel peers, Ralph Lauren stock actually costs more relative to its profits than do either of its rivals. Priced at 24 times earnings, Ralph Lauren shares carry a valuation 19% higher than shares of PVH, and cost 36% more than V.F. Corporation. But does Ralph Lauren stock deserve this premium valuation? It hardly looks like it does. While Ralph's 9.8% sales growth rate over the past five years is certainly respectable enough, it's not all that much better than the 8.6% sales growth rate that V.F. Corporation threw up -- and it's less than half the growth rate of PVH. Yet, even after looking at this last chart, a couple questions spring to mind. For example, what's the basis for analysts thinking that Ralph Lauren will produce faster earnings growth than -- for example -- PVH produces? After all, PVH is the company growing sales faster. That would seem to indicate that PVH's products are the more popular, and that PVH -- not Ralph Lauren -- is the company more likely to marry high profit margins with high sales growth to produce pricing power ... and strong earnings growth. Even if the analysts are right, and even if Ralph Lauren does grow as it's predicted to, does it really make sense to pay 24 times earnings, and 31 times free cash flow, to own a share of Ralph Lauren stock? Does it make sense to do this when even in the best case, Ralph will only produce respectable, but hardly extraordinary, low-to-mid-teens profit growth? I don't think it does make sense. Overpriced and underperforming, I think Ralph Lauren stock is likely to keep on going nowhere.